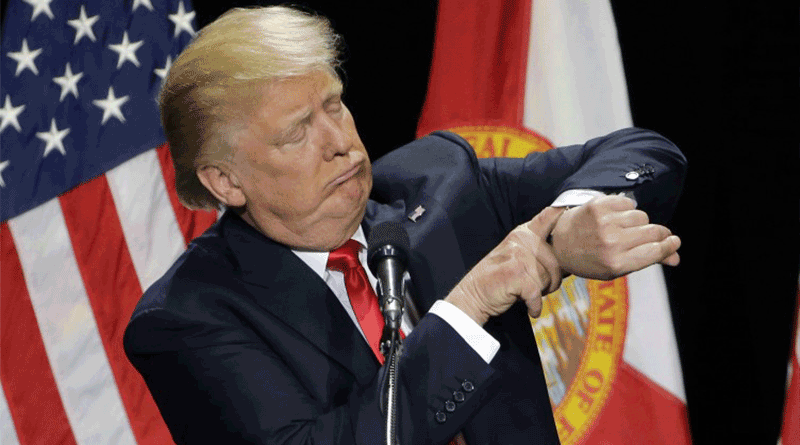 Today on Who Wears What Watch, we take a look at what watches presidential hopeful, reality TV presenter and billionaire Donald J. Trump wears on his wrists. This may sound like an easy task given his highly publicized life, however the journey has been a strange one and anything but easy. They say you should never discuss money and politics among friends, so we’ll try to stay neutral here and stick to the facts. Donald J. Trump has a surprisingly uninspiring collection of watches for a billionaire. At least we think so. This is not uncommon practice of presidential hopefuls trying to be more relatable by opting for an every-mans watch like a Timex; worn by Clinton, Geoerge W. Bush and Jimmy Carter. With Trump however, he rarely reveals his wrists from his standard thick-cuffed-shirts which, coupled with Trumps tendency for a flailing right arm and a stationary left, has really given Twentytwoten.com a challenge. If there was ever any debate to Trump’s propensity for ostentatious and flamboyant taste, we will firstly direct you to Trump’s very own watch collection – this seems like a satisfying starting point. In 2005 Trump released the Donald J. Trump Signature Collection of watches. In 2006 Trump ceased production of the Donald J. Trump Signature Collection of watches. The collection featured around 20 pieces and since production only lasted around 365 days there isn’t a lot of information, reviews or stock; making the collection as much of an enigma as its figurehead. There are a few online stores with stock which seems to increase in price (not value) as we descend towards election day. Since the Donald J. Trump Signature Collection has stopped production and therefore doesn’t require promotion, Trump is free to wear whatever he likes. Here’s our exhaustive list of everything we have seen on, or even near, Trumps wrist. I’ll prefix this by section by stating this cheesy photo at the 2009 AZAD sponsored Celebrity Apprentice live finale is the only confirmation that Trump has ever held an AZAD watch, let alone owns one. However if you believe the rumor mill, Trump is an ‘AZAD enthusiast‘ who was given this piece of AZAD which starts at a whopping USD$9,950. If you decide to roll this piece in diamonds, it will costs you as much as USD$29,500. We’ll also note that in 2009 this piece was limited to just 30 pieces. In 2016 it is still very much available on their website. 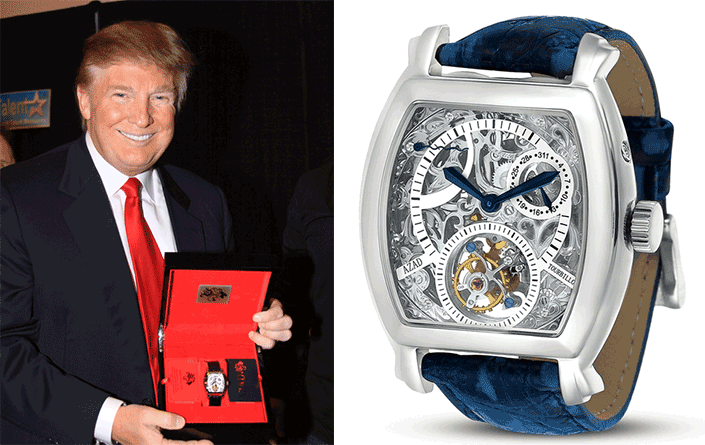 Conclusive evidence that Donald Trump is not a trend-setting horology icon. The consensus around the office is that Trump appears to be wearing a Patek Phillip Ellipse in rose gold. The one shown above is a Ref. 3545, but that is just a best-guess. Eager to bring you facts, we’ve made several attempts to contact Trump to no avail. Surely he can’t be that busy? 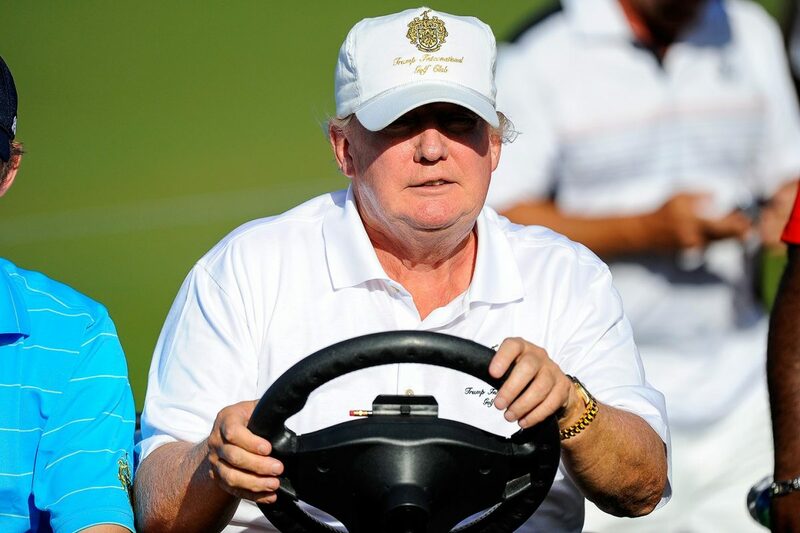 On close inspection of the Donald on this excursion you’ll notice the cyclops on his gold Rolex which together indicates a Day-Date or a Datejust. So this is where the spotting ends for now and we’d love to hear from you and you’re keen watch-spotting eyes. Rumor has it we may even see a future release from the Trump Collection, but all we’ve heard about the design is that it has really small hands.